Will science and good shoes help break the two-hour marathon barrier this weekend? This weekend, Eliud Kipchoge, Lelisa Desisa and Zersenay Tadese will attempt to run a marathon in under two hours. It’s a bold – and some say impossible – goal, and a hell of a marketing campaign for Nike, which has been dumping time, money and resources into Saturday’s event for a few years now. The Breaking2 race (not to be confused with the mid-80s breakdancing sequel of similar name) was announced late last year, but its timing was only unveiled earlier this week, due to a confluence of factors involved in making the conditions perfect for the three runners involved. The event goes down at 5:45 a.m local time in Monza, Italy, just outside of Milan. The actual event will be closed to the public Nike will, naturally, be live streaming the race, which kicks off at 8:45PM PT, 11:45PM ET tonight. So what’s Nike bringing to the table here? Setting is part of story, as is the selection of the three runners from its roster of sponsored athletes. Sixty-five employees have been working on the project, along with a team of researchers at the shoe giant’s Sport Research Lab, poked and prodded around 20 or so candidates to determine who was best suited to hit the goal, based on factors like running economy and VO2 Max, which measures oxygen intake during a workout – that thing that they’re calculating when runners wear the mask with all the tubes on the treadmill. And naturally, they’ll all be wearing Nikes. All three runners will be sporting a variation of the Zoom Vaporfly Elite. The shoes were first announced in March and will be hitting stores around next month. Should any of the trio eke in under the two-hour mark, it’s tough to imagine a much better ad for the $250 shoes. Each runner will have his own specially tuned version of the shoe, of course, but the underlying principles are more or less the same. In addition to providing a feeling of forward motion, the carbon fiber plate critically serves to add bending stiffness, tuned to improve stride-by-stride efficiency for the three athletes and minimize energy loss over the course of the race. 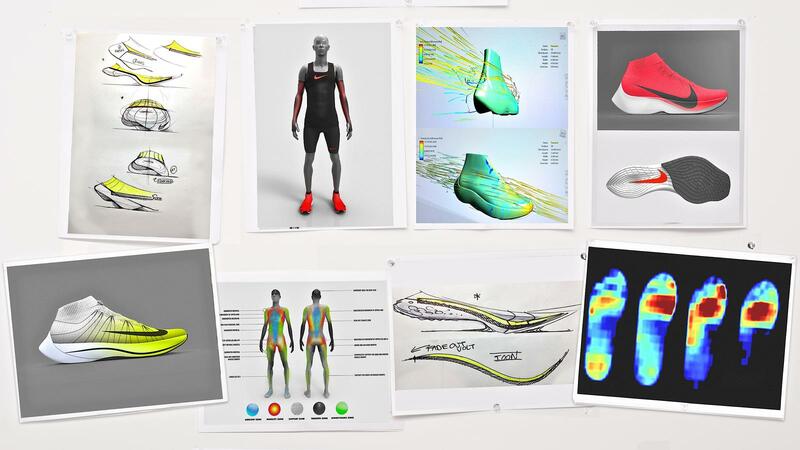 The company’s Director of Next Generation Research Brad Wilkins claimed to TechCrunch in a conversation this week that the shoes are capable of reducing the amount of energy exerted when running – a key factor when running these distances. Klipchoge, Desisa and Tadese have all gotten within 11 minutes of the time. Kipchoge of Kenya came the closest of the three, when his 2:03:05 time at the 2016 London Marathon became the third-fastest marathon time, ever. Nike has invested a fair bit into making sure the conditions are ideal, from the temperature, to the weather, to the angles of course, finally setting on a race-track in Italy that’s home to the Formula One Italian Grand Prix. It seems a bit arrogant on Nike’s part to suggest that the show company can ultimately do much to improve upon the times of three of the world’s fastest runners – a fact that the company seems to accept. There’s plenty of doubt leading up to the event. While it’s commonly accepted that the two-hour barrier will eventually be broken, most projections have it happening much further out, in spite of many running having come within what appears to be spitting distance of the number. Runner’s World did a comprehensive study on what it would take to hit the number and landed on 2075 as the approximate year it would go down.